It began immediately after Independence when four young booksellers started selling second-hand books and magazines on the pavement outside the Balaka cinema hall. Within years, that small step became a giant leap forward for the bookworms of the country. 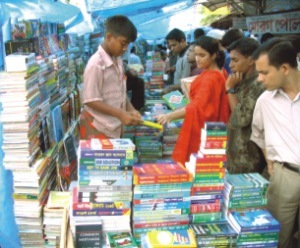 With prices of both local and international books spiralling at a geometric progression, Islamia Book Market in Nilkhet provides the readers books and magazines at unbelievably affordable prices. This, along with its close proximity to most of the major educational institutions in the city, have made Nilkhet a lucrative place to run any business. Ownership of shops that were once upon a time sold at Tk 400 now costs a whopping Tk 3 lakh. Nilkhet means books, and of course business too.